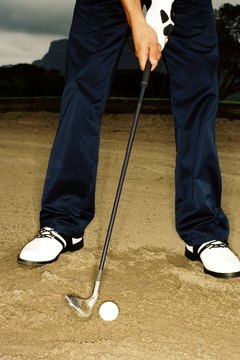 Sand wedges have bounce angles of 8 to 16 degrees. The whole idea of bounce often confuses golfers. At its simplest, bounce is merely the angle between the ground and the sole of a club at proper address. Having said that, bounce is more than just an attribute of a club. Bounce can make a big difference in what a shot does, or whether you should even attempt a shot. In some cases, you can actually change how the bounce on your club behaves. All irons have some bounce. Its purpose is to limit how much the front edge of a club digs into the ground when you contact the ball. Most irons have only a small amount of bounce. Fairway lies are generally pretty good and you want the club to take a small divot after you hit the ball, so lower bounce allows the front edge to dig slightly into the firm ground. Other clubs, most notably sand wedges, have more bounce to prevent the club from digging into soft sand too much. Generally, you don't worry about bounce unless you're buying a special club such as a wedge. In these cases, bounce is measured in degrees – typically ranging from 8 degrees (low bounce) to 16 degrees (high bounce). Higher bounce means the leading edge of the clubface is higher than the trailing edge. Bounce can be a problem on some shots. Using a low-bounce club when conditions are soft can cause the club to dig too deep. This often happens in soft sand or when playing a flop shot from thick rough. In these cases, the ball may not fly far enough or might barely move because the club digs goes under it. Similarly, too much bounce on a firm surface can cause the opposite problem. The extra bounce may prevent the front edge from ever touching the ground or could even cause the club to bounce off the ground before you ever hit the ball. Instead of the clubface hitting the ball, the club's front edge hits it, causing a low, thin shot. You can change the effective bounce of the club in various ways. The late Seve Ballesteros was known for playing sand shots with every club in his bag, even 3-irons, and getting them to behave like wedge shots by making a very flat swing with an open clubface. You can sometimes use a high-bounce wedge off of a tight lie by moving the ball back in your stance, delofting the club and eliminating the bounce almost entirely. Altering the effective loft of a club in this way requires some skill, but it can allow you to make otherwise improbable shots. Although your regular set of clubs comes with a predetermined amount of bounce, you'll want to specify the bounce you want for your wedges. Low-bounce wedges are best for shots off tight lies and in bunkers with very little or very firm sand, and for players with very steep swings. High-bounce wedges are best for shots from the rough, soft lies, bunkers with a lot of sand or very soft sand, and for players with flatter swings.